Explore the beauty of Thar Desert during sun set. After breakfast at hotel in Delhi, proceed for Mandawa which is also known as the open art gallery. Situated in the Jhunjhunu district of Rajasthan, this place is famous for its beautifully painted Havelis, opulent architecture, chattris and cenotaphs. You can also visit the village at your leisure to experience the colorful culture and tradition of Shekhawati. Enjoy your overnight stay at hotel in Mandawa. After taking a delectable breakfast depart to Bikaner. En-route visit a famous Deshnok Karni Mata Temple after which we will straight drive to Bikaner. The city was founded in 1488 by Rao Bikaji a descendent of the founder of Jodhpur. On arrival to the city, check-in to the hotel and after taking a short break you may explore the Junagarh Fort and Lalgarh Palace. Overnight stay will remain scheduled at your hotel only. Post breakfast departs to Jaisalmer; we will explore a legendary “Pokaran Fort” and will feast for lunch there only. Later, we will drive straight to the “the golden city” of India, Jaisalmer. And on arrival check-in to the hotel for overnight stay. After breakfast, explore the city by visiting Patwon Ki Haveli, Salim Singh Ki Haveli and Nathmal Ji Ki Haveli. Later, take a tour to Jaisalmer Fort which is commonly known as Golden Fort or Sonar Fort. After witnessing the glory of this golden city, depart in late afternoon for sam sand dune which is approximately 45 Kms far from the main city of Jaisalmer. This tourist hot spot is famous for its rippling and scenic sand dunes and various local cultural fests. It is also a perfect sunset spot and a perfect pick for experiencing the first hand desert life. Overnight stay will remain scheduled in the hotel of Jaisalmer. Post breakfast drive to Jodhpur to speculate the glorious history of Rajasthan. The second largest city of Rajasthan is also well known for the heroic and magnificent history of Rajputs. On arrival check in to the hotel and after taking a short break visit the magnificent Mehrangarh Fort, and Jaswant Thada. After sightseeing the majesty of this city, take an overnight stay at hotel. After breakfast, visit Umaid Bhawan Palace and later proceed to Udaipur. En route you will have an opportunity to visit Ranakpur Jain temple. Constructed out of sparkling marble stone, this temple is famous for its excellent architecture and the exquisitely craved 1,444 pillars. After sightseeing this amazing place, continue your journey to Udaipur. On arrival to Udaipur, check in to the hotel for overnight stay. In Udaipur, after breakfast, start a new morning of your India tour by exploring the romantic city of Udaipur. Also known as the “City of Lakes” and the “Venice of East”, Udaipur has many picturesque backdrops. The tourist hot spots of this destination are City Palace Museum, Jagdish Temple, and Sahelion Ki Bari. In the evening, enjoy boat ride in to Lake Pichola. Later you are free for independent activities with an overnight stay scheduled at the hotel. After taking breakfast in Udaipur, leave for Pushkar. Known for its unmatched devotional importance this city is said to be created by God Brahma himself. With around 400 temples and 52 Ghats, one can feel great spiritual positivity here. The attractions of this town are: The Bhrama temple and the colorful cattle fair. An overnight stay will remain scheduled at the hotel. Post breakfast, we will start our journey to the next destination, Jaipur which is also known as Pink City. On arrival, check in to the hotel with a whole day scheduled at your leisure. If time permits you can enjoy the chaos of local streets and delicacies of Rajasthani taste all at your own. Later stay overnight in hotel. After breakfast at the hotel, we will start our tour of the city and its world famous spectacular heritage buildings. We will start with Amber Fort where the elephant ride from the foothill of Aravali to the entrance of Amber fort is a must do activity. Later visit City Palace, Central Museum, Jantar Mantar (Observatory) and The Hawa Mahal. Late afternoon is kept free to visit the famous markets of Textiles, Gems, Carpets, and handicrafts. Return to the hotel for overnight stay. After breakfast in Jaipur, pack your travel bags to visit Agra. En route to Agra, we will get an opportunity to Visit UNESCO World Heritage Site, Fatehpur Sikri where the main attractions are Punch Mahal, Deewan- e-Khaas, Tomb of Salim Chishti and Buland Darwaja. After taking a brief tour there, continue drive to Agra. On arrival in Agra, check in to the hotel. After freshen up we will leave to visit Agra Fort. 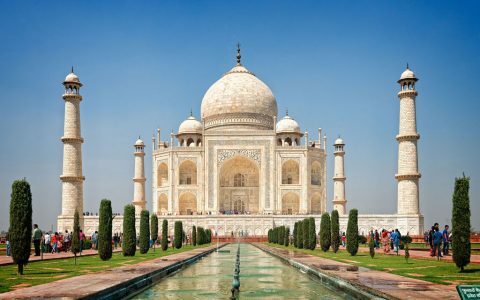 The tour continues with a visit Itmad-Ud-Daulah and Mehtab Bagh, where one can see the Taj Mahal from the other side of Yamuna River. Later back to hotel and stay overnight. Starting your day with a glimpse of the marvelous Taj Mahal is the best way to kick starts your day. Visit this world heritage Monument in dawn to beautify your mind and soul in the calmest way. Later we get back to hotel for breafkast and checkout at afternoon to visit Agra Fort. Later in the evening, depart for Railway station to board an overnight train journey to Varanasi. On arrival at Varanasi Railway Station our driver will assist you to the hotel. Check in to the hotel, and after freshen up and taking breakfast visit Assi Ghat, Dasaswamedh Ghat, Harish Chandra Ghat, Manikarnika Ghat, and Tulsi Ghat. 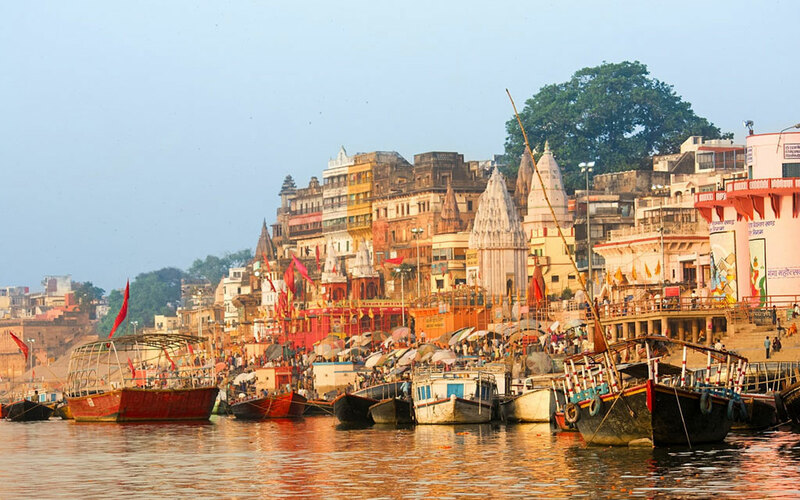 Later in the evening, attend the mesmerizing prayer ceremony at the bank of River Ganges through a boat ride. Overnight stay will remain scheduled in the hotel. Get up early in the morning to enjoy boat ride at dawn in the holy river of Ganga and witness the true essence of Varanasi. The holy whispers of the Ganga worshippers, enchanting temple bells and the steady streaks of boat paddles give you a treasure of memories. After enjoying a mesmerizing morning get back to hotel and have breakfast. Thereafter take an excursion to Sarnath which is a Buddhist pilgrim in India. It was here that Lord Buddha preached his first sermon to his first five disciplines. Later come back to hotel and stay overnight. After taking a delicious breakfast, visit the holy city of Kashi by your own to collect some memories and moments. Then it is the time to pack your bags and reach to the airport to board flight to Delhi. On arrival check in to the hotel our driver will assist you to hotel. This day you can spend your free time at your own leisure and meanwhile we assure your safe and happy transfer to the International Airport. 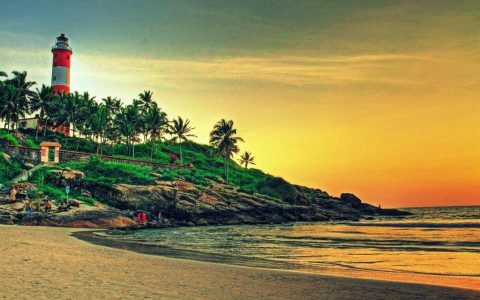 We are affirm to make your every travel package, the best one so that you can take back home a plentiful of illustrious memories of a fabulous India Tour.